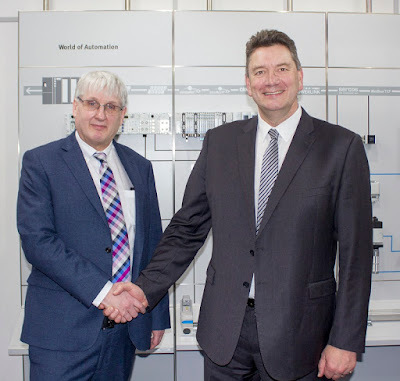 Rotherham-based Acorn Industrial Services Group, one of the largest power transmission distributors in the country, has been appointed as the UK's first Official Partner for Electrical Automation by Festo, the German multinational industrial control and automation company. Established in 1983, Acorn supplies bearings, power transmissions and linear systems to a global customer base. The growing company moved across the borough to Hellaby in 2013, investing over £1.25m in a new HQ. In 2015 it was acquired by the Swedish industrial group, Axel Johnson International, for an undisclosed sum. Having recently undergone a restructuring of their Official Partner network, Festo has signed with Acorn as a partner for linear actuators, positioning actuators, servo press systems and gantry handling solutions. The partnership has a focus on making it easy for machine builders, OEMs and automation end users to specify and set up automated systems. Simon Gillingham, Linear Motion product manager at Acorn, said: "Moving into the supply of complete linear movement solutions is a major step forward for us. We are delighted to be working with Festo, an established leader in automation technology. This partnership will enable us to provide customers with complete handling systems and linear axes, quickly configured and quoted along with data sheets and CAD models. "This will be a huge time and cost saving benefit to design engineers. Once the application requirements have been defined and agreed, we can then propose a complete solution, comprising components that will all work together. Having all the components available from a single supplier will provide customers with the reassurance that the system components will work together perfectly." Steve Land, indirect sales manager for Festo, said: "In order to complement our industry-leading direct sales operations, we have taken the strategic decision to only work with partners who live up to the requirements that customers place on Festo as a performance leader. The quality of our partners is therefore a key element in the new network, alongside ensuring regional coverage. Our Official Partners have been selected because they can provide a combination of expert service and in-depth product knowledge, as well as demonstrating their commitment to our company objectives."